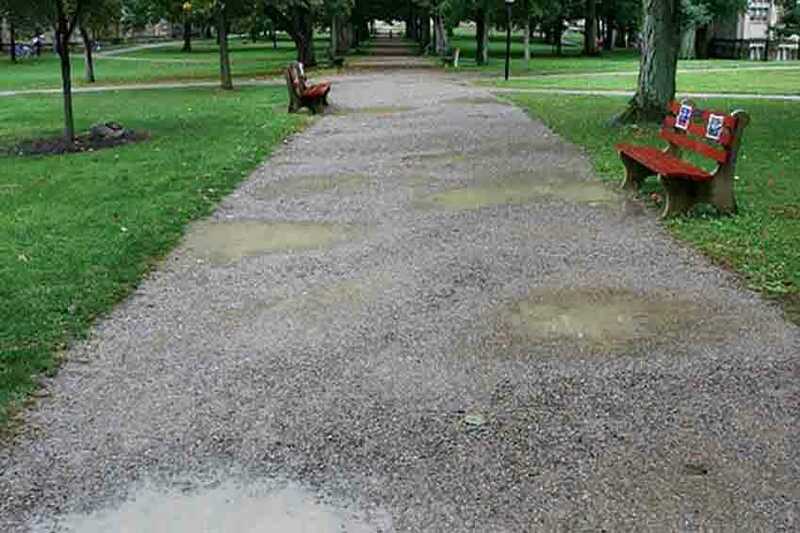 The Right Path: Kenyon College | Envirobond Products Corp.
Kenyon College in Gambier, Ohio needed to renovate its historic Middle Path as it had become impassable in foul weather. It was no longer the right path for their needs. 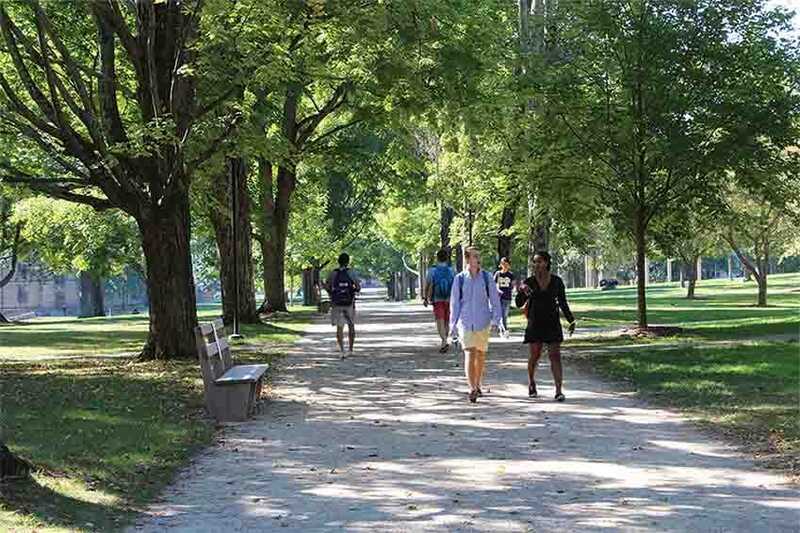 Kenyon College’s Middle Path is a 3,600-foot-long walk made from a local river stone. It is a focal point for the landscaping on campus. It had a lovely color and texture, and the crunchy sound it made underfoot was pleasing. But it was this looseness that allowed the walkway to wash out during rainfall, leaving muddy puddles – or icy patches in the winter. Before the renovation, puddles and muddy areas were common on the path, making travel difficult. Photo by Matthew Girard. Kenyon Collete hired Michael Van Valkenburg Associates (MVVA) in 2010 to come up with a solution for this problem. They needed to design a surface that would be accessible in all weather conditions but retained some of the charm of the original pathway material. Concrete pavement was not suitable for this reason. After considering a wide range of solutions, MVVA proposed using decomposed granite for the project. Decomposed granite (DG) is a textured paving material that preserves the look and feel of a natural stone pathway. But stabilized DG doesn’t degrade over time, is easily repairable and provides a stable, firm surface. DG releases a thin layer of aggregate that is crunchy when walked on. This means that users will have a pleasant experience similar to the original river stone walkway. MVVA was also able to approximate the color of the river stone as there was a wide range of local granites available. DG’s sharp edges allow this angular stone to lock together when compacted. There is also a high percentage of fines to fill the voids between the stones. While DG can be installed on its own, MVVA designed the Kenyon project with the integration of a plant-based binding agent to further bond the aggregate together. When combined with a binding agent, it is now referred to as “Stabilized DG”. An important feature that the organic binder in this project had to have is water permeability. In the first test panels that were built, water could hardly penetrate the surface before running off. Saturating the DG required enormous amounts of water. As well, the mockups became soft and muddy during the freeze-thaw cycles in the winter. The mockups were a failure. Once again, this was not the right path for Kenyon College. MVVA did a complete analysis to determine the cause(s) of the failure. They looked at the compaction of the subgrade, the fact that the stabilizer resisted absorption of water, insufficient drainage in the surrounding soil. They contact other landscape contractors who had undertaken similar work. MVVA sourced the aggregate for the Kenyon mockups from Kafka Granite in Wisconsin. At that time, Kafka was testing an alternate organic stabilizer. It was our organic binder, Organic-Lock. Envirobond became an active participant in testing and developing the stabilized DG required to move this project forward. Kafka compared our binder in trials against other stabilizers in trials that varied the DG aggregate size. In the summer of 2013, MVVA installed two new test panels on the Middle Path by two different contractors. The two panels held up well through the following difficult Ohio winter and were deemed a success. Kenyon College finally had the right path for their Middle Path. New LED lighting on 12-foot poles and custom black locust benches completed the renovation. Photo by Neil Budzinski. DG is not a totally carefree material. However, with the use of Organic-Lock as the stabilizer for DG, maintenance is vastly simplified. You will still need to do winter maintenance and pathway repairs with stabilized DG. The Organic-Lock advantage is that its self-healing nature allows maintenance and repair to be done much more easily. It is also ADA (Americans with Disabilities Act) Compliant and eligible to earn LEED points. It could be the right path for your project. MVVA now specifies our organic binder, Organic-Lock for all their DG installations. They work through our dealers in the US – Kafka Granite of Wisconsin and Read Custom Soils near Boston. With proper consideration given to pre-hydration procedures, compaction, proper drainage slope design and the correct DG grain size, consistent and beautiful results can be achieved. This is an abstract from an article in Landscape Architects Magazine by Neil Budzinski and Matthew Girard, senior associates at Michael Van Valkenburgh Associates, Inc.